Submitted by JoeKeresztury on Sat, 03/19/2011 - 10:08. 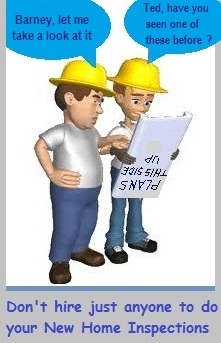 Why should San Antonio area buyers of - To Be Built Homes get Construction Phase Inspections? Well, because there are no perfectly built new homes. Think about it, a newly constructed home is not built on an assembly line in perfect conditions like your new Ford Explorer or your Toyota Camry was. 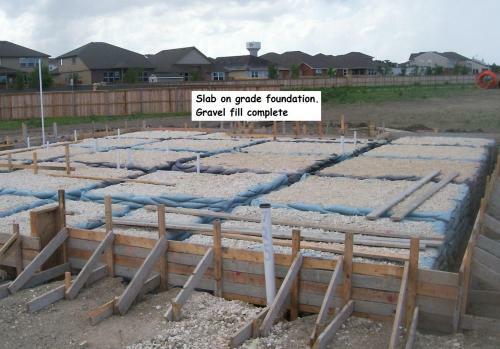 START OF A NEW HOME - Pictured here is the process, in progress of a slab type foundation. Forms have been set. A low PI (Plasticity Index) Fill placement along w/ Beams / Footings present as needed, along with the plumbing rough in having been completed (before fill), waiting for for the Cable and / or Rebar type Slab Foundation reinforcement. Actually your new home is built out in an open field, a home site you picked out or land that a builder has chosen for construction. Building a new home is most likely the biggest investment you will ever make, well that is, until you decide to build that next, larger, more luxurious one as many families eventually do for an expanding family or to keep up with the Joneses. So if you are going through the New Home Construction process from start or are buying a new home during or at completion of construction, consider the cost of the inspection(s) as compared to the value of the investment you are making for the home. It is a small fee to pay, even if it’s only for peace of mind, or especially if the inspection uncovers minor or in some cases major problems that the builder corrects that may come back to haunt you or cost you in years to come. 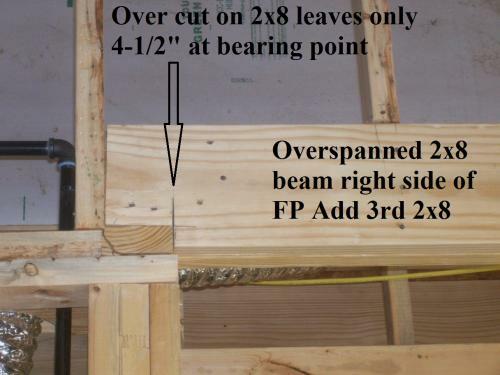 Over spanned, load bearing beam in photo shows (2-2x8 w/o ply and glue). The beam was also notched to sit on the top plate, with an over cut leaving only 4-1/2" at bearing point. There was room for a third 2x8 in back, sitting on the top plate (not notched)- and was added per inspection for the correction needed. Most likely your builder, whether a custom builder or a large volume builder is a good, quality homebuilder. A home being built has thousands of components that go into it, so mistakes can and will be made. Considering all the subcontractors, suppliers and manufacturers, there are thousands of workers, craftsmen and technicians that work on your homes products before delivery and/or at the home site. So, human error is always a possibility. to assure you of that. Whether you are building from start or buying during construction or after the new home is complete hire an experienced new home construction inspection specialist for your new home, it will pay off, even if only for peace of mind but probably for much more. 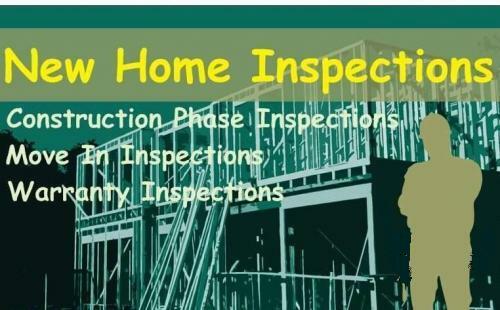 See our blog on New Home Construction Phase Inspections.